What's the Difference Between a Lager and an Ale, Anyway? When it comes to talking about beer, there are no two words that get thrown around as much as “ale” and “lager.” This isn’t strange, since all beer falls into at least one of these categories… It’s just that many of us have been taken down a road of miseducation. But fear not: We’re here to help you understand the differences between the two. Editor's note: Zach is a Certified Cicerone and owner of Alphabet City Beer Co. and Governors Beer Co. in NYC, so you can trust most what he says. At least about beers. Lager is my favorite style of beer. What can you tell me about it? Well, despite what lazy marketing from macrobreweries may have you believe, it’s not one style, it’s a broad category of many different styles. It’s ok if you never knew that. Literally billions of dollars have been spent in the process of pushing a strange mix of nonsensical buzzwords into your face that glaze over this fact. None of this is to make you feel like you need to be an expert: It’s just that understanding the distinction between ales and lagers can make it much easier to find a beer you like. Alright, fancy beer man! Give me a one word answer on how lagers and ales are different. ...OK, technically that was two words, but I didn’t think it would be that easy. It’s really that simple? Yes, it is really that simple. Ales and lagers are each made using different strains of yeast. Simply put, lagers are brewed using bottom-fermenting strains of yeast held at colder temperatures (around 40-52°F), while ales are brewed with a top fermenting yeast that operates at warmer temperatures (around 55-77°F, usually). Of course, there’s a little more to it than that! Lager is a noun (which translates from German as “storage”), but it’s also a verb that refers to the cold storage of beer while it ferments. There’s a ton of biochemistry involved in fully understanding it, but suffice to say that lager yeast traditionally require a little more time to brew than ales. It’s also worth noting the fascinating collision of cell biology, craftsmanship, and overall human civilization that has taken place in brewing. Specific strains have even evolved over time through brewer selection, honing the selection process even more than just picking column A or column B. So if you’re making a saison, it’s not always as easy as just hitting up Amazon for an “ale yeast.” Today, entire companies specialize in propagating entire subcategories of cells for making many specific styles. Wow. This is crazy! Although I’m pretty sure I’ve read that it has something to do with the color of the beer too. Contrary to a weirdly held popular belief, the color or clarity of a beer has nothing to do with its ale or lager classification. 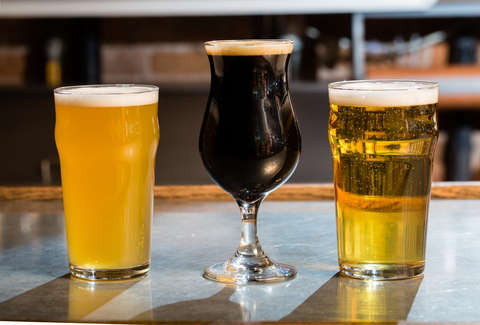 There are blonde ales that are as pale as classic Czech pilsners (a lager), and smooth, dark lagers like schwarzbiers that are as opaque and jet black as stouts (an ale). 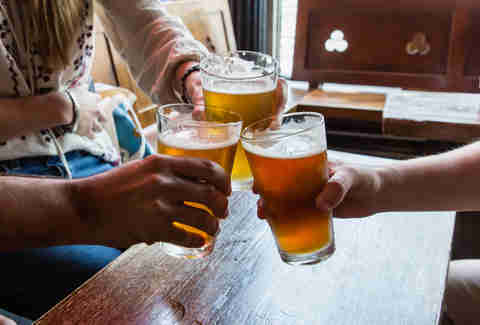 That’s because color in beer is imparted by the malt bill (and in the case of certain recipes, additives like fruits, spices, and other random ingredients), and has nothing to do with the yeast being used. ...OK, so then if that’s not the case, it’s definitely the alcohol content! My friends tell me that lagers are way lighter. Sorry, but your friends are lying to you. Unless you consider a 9.5% ABV doppelbock a “low-alcohol beer,” lagers can sometimes make up the strongest beers being offered on a menu. Ugh. So then at least they should taste different? In so many cases, yes! Ale yeasts produce more esters and phenols during fermentation, which are the byproducts that give beer those non-hop, non-malt driven flavors. If you’re wondering what that means, think about the last time you had a spicy, fruity Belgian ale that smelled of cloves and pepper, or a German hefeweizen that tasted like ripe banana and bubblegum, or an English ale that had perfumey, floral stewed fruit flavors. This is in stark contrast from the clean, crisp, rounded flavors and aromas of beer fermented with lager yeast. With beer, there are always exceptions to the rule. Some pretty famous styles can be considered hybrids of the two. Kölsch and altbier, for example, are made using ale yeast that is fermented at lager temperatures. California common lager (or “steam beer,” if you’re down with the proprietary name that was copyrighted by Anchor Brewing Company) is an American-born style that involves lager yeast brewed at ale temperatures. This middle ground can be a pretty friendly place if you know what you’re doing. Kind of a best of both worlds situation! So what are some popular examples of each type? Lagers have a history that has deep German and Bavarian roots, so it can help to think of an area when trying to remember the categories. Besides that, pilsners, adjunct lagers (think big brewery beers made with lots of rice and corn), schwarzbiers, bock, doppelbock, and Vienna lagers are all prime examples. Ales are more traditionally linked with Belgium and Great Britain, so think IPAs, stouts, pale ales, brown ales, saisons, dubbels, tripels, and quads. Of course, the world is a small place these days and you can brew a saison as easily in Phoenix as you can Flanders, so never make assumptions just because of where a beer is coming from. This seems so basic. Why is it so hard to understand? The point is the distinction is important only to get a better understanding of what you already like. So please don’t beat yourself up over this. Even well-intentioned food journalists often make this mistake! Now take this as an excuse to go hit up your favorite local beer bar or shop and do some homework. Zach Mack is Thrillist's contributing beer writer, the owner of Alphabet City Beer Co. and Governors Beer Co. in NYC, a Certified Cicerone®, and absolutely nothing else. Follow him: @zmack.